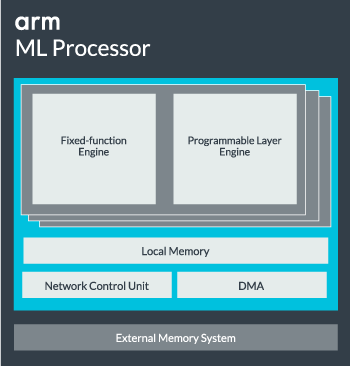 The Arm Machine Learning processor is an optimized, ground-up design for machine learning acceleration, targeting mobile and adjacent markets. The solution consists of state-of-the-art optimized fixed-function engines that provide best-in-class performance within a constrained power envelope. Additional programmable layer engines support the execution of non-convolution layers, and the implementation of selected primitives and operators, along with future innovation and algorithm generation. The network control unit manages the overall execution and traversal of the network and the DMA moves data in and out of the main memory. Onboard memory allows central storage for weights and feature maps, thus reducing traffic to the external memory and therefore, power. Most efficient solution to run neural networks. Designed for the mobile and adjacent markets. Optimized, ground-up design for machine learning acceleration. Best-in-class performance with state-of-the-art, fixed-function engines. Programmable engines for future innovation and algorithms. Massive efficiency uplift from CPUs, GPUs, DSPs and accelerators. Completes Arm's heterogeneous Machine Learning platform solution. Industry-leading performance in thermally- and cost-constrained environments. When combined with the Arm Object Detection processor, provides highly efficient and optimized people detection. Specially designed to provide outstanding performance for mobile; optimizations provide a further increase in real-world use cases up to 4.6 TOPs. Best-in-class efficiency at 3 TOPs/ W.
Programmable layer engines for futureproofing. Highly tuned for advanced geometry implementations. Onboard memory reduces external memory traffic. Arm NN acts as a translation layer between major neural networks frameworks, such as TensorFlow and Caffe, and the Arm Machine Learning processor, as well as other Arm IP.